The small music museum in Venice mainly exhibits old instruments. It's one of the few museums in Venice that doesn't cost admission. The museum is located directly in the old town in a church. Most of the estimated 150 instruments are from the 16th to 19th century. Among them are about 40 violins, a focus of the Museum of Musical Instruments Venice. But in the Museo della Musica (Italian name) you will also find about 20 violas, some cellos and double basses as well as about 10 mandolins. You can also see some historical flutes, harps and much more. Interesting is the musical instrument Psalterium from the 17th century. The psalterium later developed into the zither and the dulcimer. There is also a small exhibition in the music museum about some famous composers like Antonio Vivaldi. Vivaldi was born in Venice in 1678. He was one of the most important composers at that time (Baroque) worldwide. Everything is displayed in one big room. It is a former church San Maurizio, a church in neoclassical style. The church San Maurizio was built in 1806 by the architect Giannantonio Selva, who also built the world famous theatre La Fenice in Venice. It is on the square San Mautoizio in the north of the Sestiere (district) San Marco in the middle of Venice. The Musical Instruments Museum can only be reached on foot. One of the few museums in Venice that doesn't cost admission! You can just go in. In the Museum of Musical Instruments there is a small shop selling CDs, DVDs and books focusing on classical music. Since the exhibition does not cost an entrance fee, it is fair to buy something. The staff is nice and competent, we were pleasantly surprised by the small museum in the district of San Marco. As far as we know, the Museo della Musica Venezia is open daily from 10 am to 7 pm. Venice is well known for its theatre, opera and concerts. The first-class concerts of the "Collegium Ducale Orchestra" directly in the central Doge's Palace are a hit among tourists. This very famous orchestra plays classical pieces from the baroque period. The concerts are inexpensive for Venice (about 25 Euro in advance on the Internet at the beginning of 2019). In addition, free cancellation up to 24 hours before the event is possible with the Online Tickets. Our recommendation for a brilliant cultural evening in Venice. 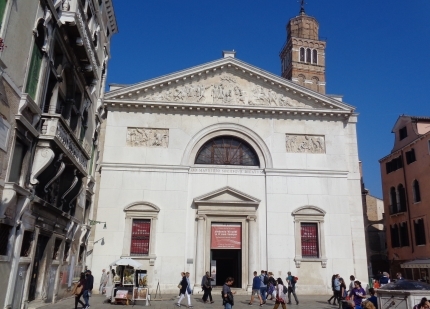 The Museo della Musica Venice is centrally located in the central old town. Nearby there are some exciting sights that can be combined with a visit to the music museum. For example the first spiral staircase of the world, the famous Scala del Bovolo. In the other direction over the Canal Grande are 2 outstanding art museums. The Guggenheim Venice and the museum Accademia. You cross the bridge Accademia to reach these two sights from the Museum of Music. Another great museum is the Museum Correr Venice at the world-famous Piazza San Marco.